Hello! Welcome to Handmade Monday! Click the link for more info and how to join in. and one of my Thank You cards (which was in a previous issue of Craftseller) has apparently found a new lease of life in Wedding Invites magazine! It's rather nice when that happens (not least because they pay you again!). I've also been sewing this week. Sewing World liked the scissor keeper heart I made a few months back, so I made them a new one, which will feature in an upcoming issue. There's a sneak peek of it above. I also made an applique bag for my sister's 60th birthday (I can't quite believe she's 60 - where did all that time go?). The gorgeous patterned fabric (from Wholeport) in my scissor keeper (above) also featured in the bag - I love the bright colours and I still have some left over so it might even resurface in another project too! can you tell there's a duck in there somewhere? 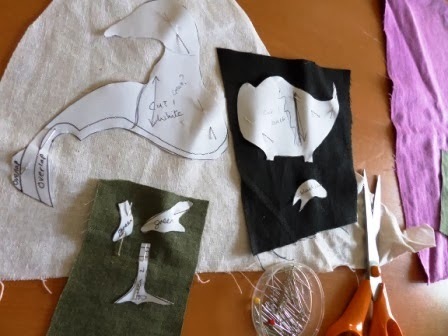 The duck applique is going to form part of a pattern for another Sewing World project (it seems everything is being recycled this week - magazine articles, fabric, applique patterns!). I've had a lovely day sewing the bag today. Well, it's always lovely until the seam ripper comes out! I love the heart fabric, such vibrant colours. Great news with your card too, what a great piece of recycling. The colours on that heart are stunning! Love the duck too. I love the fabric on the heart! I made one of your scissor keepers, they are so useful I'm not surprised a magazine has picked it as a feature. Wow, Wendy you have been in demand this week. 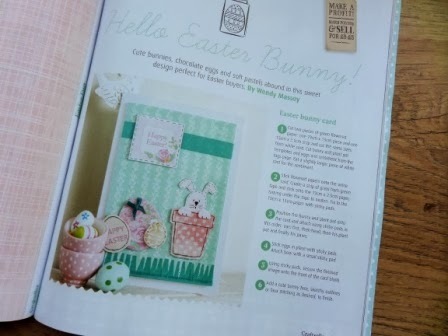 It's wonderful that you can share so many of your super ideas with crafters via magazines. I'm always excited to see what you have been up to! Yet more lovely makes. I love how these are all recycled. Ooh, I'm itching to have a go at appliqué! 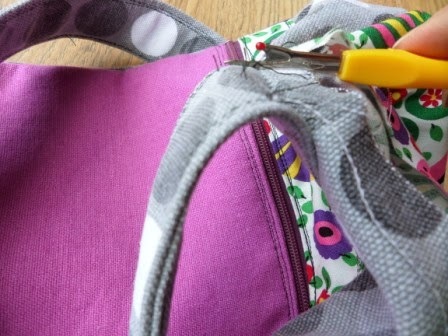 Your bag looks lovely, despite the dreaded seam ripper having to make an appearance! Fantastic colours in that fabric! Must have beens fun to sew with, especially now the sun is out! Looking forward to seeing the duck appliqué finished, it looks complicated. The fabric on the heart is a really vibrant statement pattern isn't it, great! I'm thoroughly enjoying my copy of digital cardmaking, and your goodies on the CD are amazing. Love that colourful fabric, it looks nice and cheerful to brighten up those grey days. I'm not surprised that you are in constant demand from magazines, you have so many great ideas. 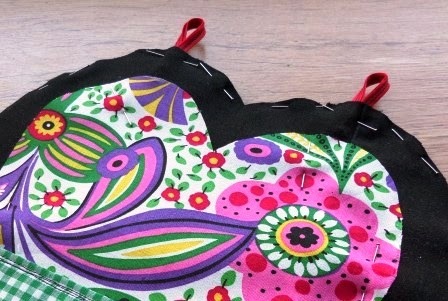 I quite like the contrast on the heart between the bright flowery fabric and the plain black fabric.